Even the shyest airplane passengers are hard-pressed to remain mum when a seatmate pulls out a book with a familiar cover. Now, thanks to the popularity of e-books, these once visible book covers are shrouded in the nondescript cases of Kindles, Nooks and iPads. This week, I tried Subtext, a free iPad app designed to enable and encourage conversations based on e-books—not necessarily with fellow plane passengers, but among readers within digital books themselves. A revamped version of Subtext, originally released in October, is available in Apple’s App Store Tuesday. On the Subtext iPad app, a reader’s profile page, with her shelf of books. Like Amazon’s Kindle already does, Subtext gives anyone who reads an e-book the ability to make notes, highlight passages and to keep private or share those notes or highlights with other users. But this app goes much further: It also lets readers post questions, polls, quizzes or even Web links that are noted in the margins of the book. Other users respond to these posts and start mini book discussions that can continue indefinitely. Subtext content can be kept private, made visible to all users or made visible only to a user’s friends. 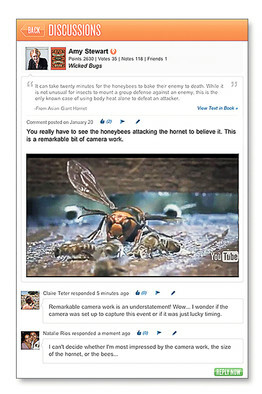 Along with comments from fellow readers, Subtext users can see comments marked in blue that are made by a book’s author or other experts. Unfortunately, Subtext smacks of immaturity when compared with other reading apps like Amazon’s Kindle app and Barnes & Noble’s Nook app. While those work on several devices and operating systems, Subtext works only on Apple’s iPad. It only runs with books from Google Books or those in Adobe’s ePub format, and the process for getting the latter—emailing the book to oneself or downloading the file from a website to the iPad—is clumsy and not intuitive. Co-founder Rachel Thomas said Subtext is actively developing for other platforms. Another issue is that Subtext is only as good as its users’ involvement. The more people comment and create discussions, the more interesting it will be for others. For this to happen, the app has to lure readers away from the devices and apps they’re already comfortable with, like the Kindle or Nook, or the Kindle, Nook and Apple iBooks apps on the iPad. I got an early look at the new version of Subtext and found it more self-explanatory than its predecessor. I signed in using my Google account, though users can sign in using a Facebook account or explore the app as a guest. By signing into my Google Account, my shelves were populated with the Google e-books I already purchased. 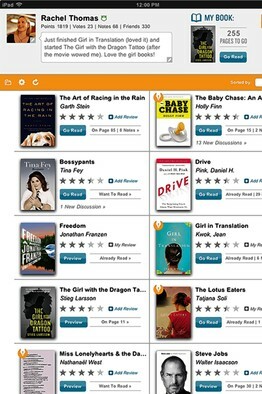 Previews of books give users a sense of what the app does. A Discussions section neatly organizes all social interactions about books in one place. Users can tap on any book cover to see all content and social information related to that book. Likewise, tapping on any user profile image lets you visit that person’s shelf. A Featured Shelves section suggests different categories of books like Critics Picks 2011 and 2011’s Most Social Books. As I used Subtext for the first time, small hint windows floated onto the iPad screen at certain points to demonstrate how things worked. One encouraged me to tap and hold my finger on the screen at a favorite book passage to see options for adding notes to that passage. I tried this a few times, including while reading a line in Tina Fey’s “Bossypants” about working moms with kids. I highlighted this passage and posed a question to all Subtext users: How many kids does Tina Fey have? Someone, who I later found out was Subtext’s co-founder Andrew Goldman, answered about an hour later, saying Ms. Fey has two daughters—a 6-year-old and a 6-month-old. The Discussions section of the app neatly organizes all social interactions in one place, so people don’t have to skip back through books to see the continued conversations surrounding a question. I like the way Subtext subtly notifies readers that notes exist: by showing a tiny thumbnail image of the user who posted the note in the margin of a book. Tapping on that image opens the note. I commented on some existing discussions by tapping the Reply button. I created a note for one book passage using a related Web link, and the steps for doing this were clear and understandable. I kept this visible only to myself; other times, I made notes about passages and shared them only with my friends who I could invite to use Subtext via Facebook or email. But what’s to stop someone from posting something inaccurate or abusive? Users can flag any note as inappropriate or as a spoiler, and the note is reviewed by the company. Users can vote on others’ comments, and over time, comments with more votes will be more broadly distributed.